Trainers almost one year ago in response to the incident on the USS Miami, in which a fi re caused over $400 million of damage to the submarine. Numerous issues arose from the in- cident, primarily fi refi ghter response and the readiness of base fi refi ghters to deal with fi ghting shipboard fi re. The need for additional training resources was identifi ed in order to train base fi re departments on what they’ll encounter when fi ghting fi res in the tight quarters of a submarine. London, Conn. 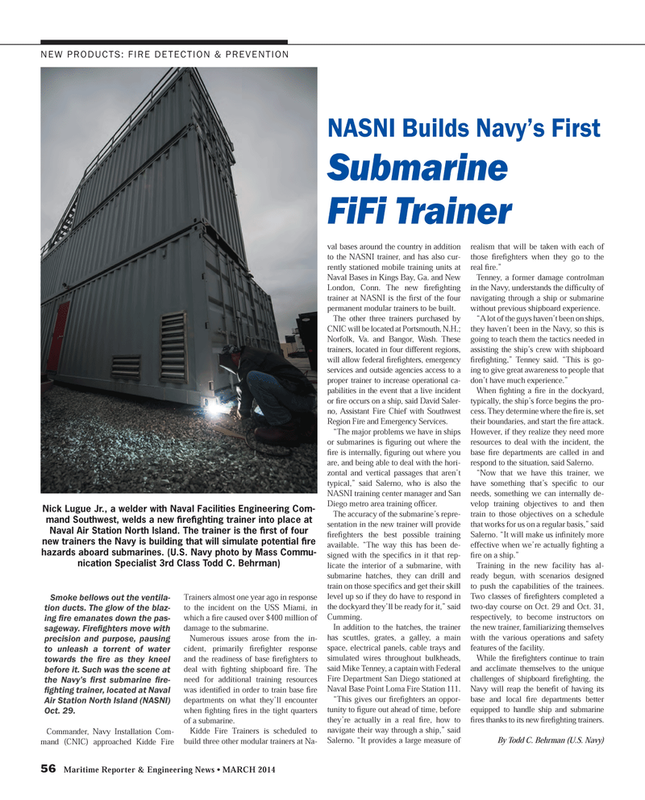 The new fi refi ghting trainer at NASNI is the fi rst of the four permanent modular trainers to be built. Diego metro area training offi cer. When fi ghting a fi re in the dockyard, typically, the ship’s force begins the pro- cess. They determine where the fi re is, set their boundaries, and start the fi re attack. Training in the new facility has al- ready begun, with scenarios designed to push the capabilities of the trainees. Two classes of fi refi ghters completed a two-day course on Oct. 29 and Oct. 31, respectively, to become instructors on the new trainer, familiarizing themselves with the various operations and safety features of the facility. Navy will reap the benefi t of having its base and local fi re departments better equipped to handle ship and submarine fi res thanks to its new fi refi ghting trainers.